Great example of what is to come in many large municipalities. There is no free market resistance to keep public unions in check because we the people are always going to pay whatever tax supports it all. Private unions have a free market check in that if they drive their employers into bankruptcy, the benefits can be zeroed out and you can start all over (to one degree or another, barring insane feds bailing them out... but I digress.) It's much more difficult to do that with public unions. Of course, Detroit is a perfect example of what DOES happen when it goes too far. The city goes bankrupt. But even then, the unions fight the bankruptcy court to keep those same benefits that bankrupted the city in the first place. I've said it many times... public unions should be outlawed. The fact that you are signing away tax revenue from future generations of people who haven't been been born yet, in whatever city, is just insane. All public jobs should be year to year, with no future benefits. Just pay them enough to provide their OWN future benefits. the highest of any city with a population exceeding 200,000." If you look at what's happening with the population of Detroit, that last part will fix itself eventually. Agreed. Even FDR warned about public sector unions. The citizens do not have fair representation at the negotiation table since our public officials are beholding to unions for campaign support. A very unhealthy relationship. One possibility, though difficult, would be to start naming individual politicians/city managers, etc. directly in lawsuits. I have to say that the lenders also have some culpability. 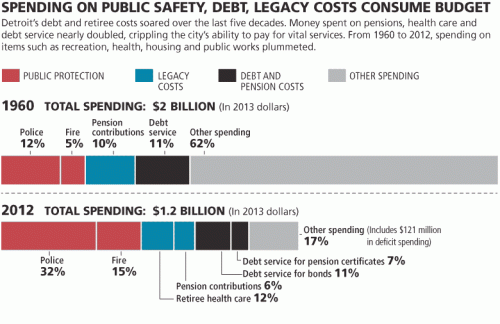 Why did they keep lending to a city that they knew was getting worse and worse off? You would think institutions would demand higher and higher interest rates and eventually lose interest (as in stop lending.) When the cash crisis occurred Detroit would have been forced to deal long before they went bankrupt. Well yes, but in another decade or two they won't have the highest crime rate of any city with a population exceeding 200,000 (even if their crime rate goes up) for the simple fact that their population won't exceed 200,000 any more. Because this is a municipality we are talking about I would be willing to bet that the lenders were assuming that if Detroit really went bankrupt, that the state and or feds would bail them out. In Pennsylvania local government, we have an explanation for that oddity: Republican love cops (and by extension firefighters) and Democrats love unions. The perfect storm. The underlying lending assumption is that tax revenue is infinite. Blame this on John Kennedy. One of his first acts was an executive order allowing federal employees to unionize as a political pay-off for labor support. States, counties, municipalities, school districts, etc. quickly followed, and we are suffering the consequences. Schools in Michigan are funded largely by state funds from sales tax. This was a change done by Engler to equalized school funding. Local districts can vote to tax themselves to supplement the funds a little, but it is deliberately limited. It's too bad that part of the bankruptcy process for a municipality doesn't include being dissolved. It won't magically fix all the problems but it would help change things up and give some possibility for improvement.